Spent twenty minutes today digging a huge hole in the front yard for Magnolia "Jon-Jon," my newest addition, who should be arriving Monday afternoon. I have peat moss and compost ready to fill up the hole, and the drip hose is set up to be on timer and water that puppy as often as needed as soon as he's in the ground. It's not the greatest timing to be planting a new tree right before a hoarde of painters descend on your house, but it was basically now or not this year for planting a magnolia. 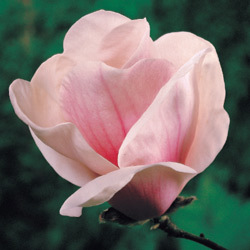 Jon-Jon has 10-12 inch flowers, a heady fragrance, and tends to be small for a magnolia (15 feet as opposed to 50 feet tall), which is good for our lot. I'm planting it in the center of the front, where there used to be a huge pine tree. We met with our painter another time to go over the contract and discuss the work we'd have done. We like these guys a lot, because they always show up on time, they answer the phone when we call, and they are very upfront about communication. Plus, the salesman likes our dog. Since we close on the line of credit on Wednesday, we'll be signing a contract this week and paying them a whole heck of a lot of money Real Soon Now. We also met with a painter who we're not interested in having paint our house, but who we're hiring as a renovation consultant, to help us draw up a master plan to work from. He's blown us off a number of times, so it was a bit rough at first to force myself to listen to him, but he seems to have an idea what he's talking about. He gave us the name of an engineer who can come up with a structural plan for us.